I kept expecting some sort of revelation to that would bring the two alternate storylines of Uncertainty into an area of explanation. Instead, by the end of the two storylines I was instead left wondering what the point was. What first seems an original concept ends up being a poorly used gimmick in place of a plot, definitive conflict, or resolution. Instead of one complete film, Uncertainty offers the option of two incomplete ones edited together. 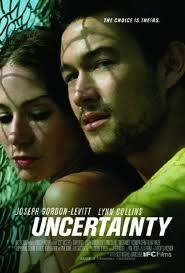 Uncertainty feels like a bad rip-off of Run, Lola, Run, though it is quite clear that the quality is not matching. There is absolutely no emphasis on the dialogue, or what the characters are actually feeling, not to mention who they are. The script wasn’t even given dialogue, and the actors created it while rehearsing with the director. The film could be watched with no sound and it would make minimal difference. What actual information is given becomes useless, because the movie is only actually about the visual correlation between opposing stories with the same characters. The film begins on the Brooklyn Bridge, as couple Kate (Lynn Collins) and Bobby (Joseph Gordon-Levitt) debate how to spend their weekend. This is a simple choice, which should be discussed with the facts clearly displayed. They can either go to Brooklyn to be with Kate’s family or they can go to Manhattan for a party with friends. This seems simple, but is discussed in cryptic and absurdly melodramatic dialogue before they flip a coin and run in opposite directions. For the rest of the film we get to see how each choice would play out, though there is no point or reason for this by the end of the film. It results in an unsatisfying feeling that much was missing from the film, regardless of how clever the filmmakers felt they were being. Clever for the sake of clever is just obnoxious.